A glorious, cool, cloudy, rainy morning! Still not a lot of rain yet (1.2 inches over the last two days plus an inch last Friday) but what we have gotten has been steady and slow, almost no runoff, just a good soaking. We have been so dry that even with last Fridays and Mondays contributions we were able to till soil yesterday and seed more flowers and another round of summer cover crops. We now hope that the rains forecast for the rest of the week will actually come and bring those seeds up. I would love to see another two inches! We are all in full blown tomato mania. While we have passed the peak of our harvest most everyone is getting ready for theirs. Last Sundays tomato cooking class at A Southern Season was a full house, went really well, and folks went away with a new enthusiasm for a spectrum of tomato possibilities. 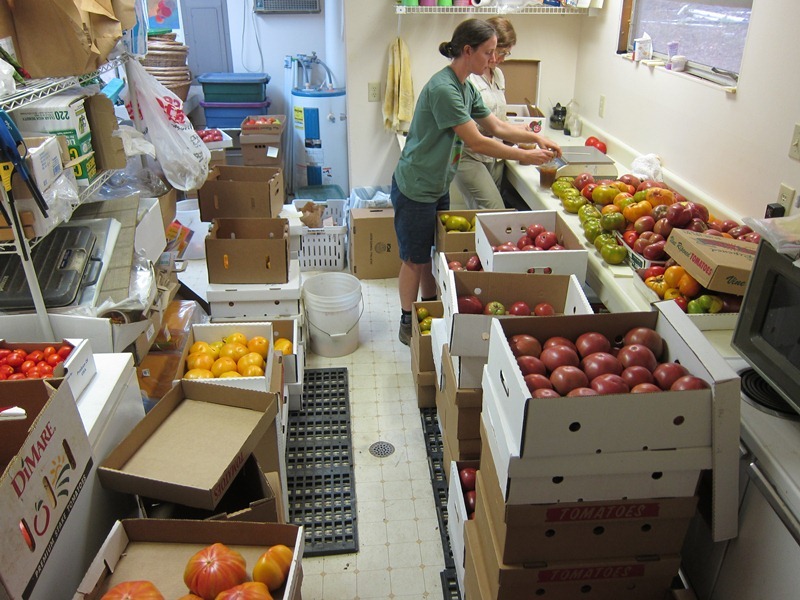 For the last several weeks we have been supplying tomatoes to every outlet possible. For the next week or so you can find ours at both the Carrboro and Southern Village Weaver Street Markets; on the menus at Elaine’s on Franklin, Pazzo, IL Palio and GlassHalfull in Chapel Hill/Carrboro and at Nanas and Watts Grocery in Durham. You can find links to all of the above here. The Carrboro Farmers’ Market’s Tomato Day is this Saturday (more info below). Of course we are all breathing a sigh of relief to be past the record setting heat wave of the last two weeks which culminated in the all-time record of six 100 degree days in a row at RDU. There will be very few tomatoes at market the third and fourth weeks of August due to no fruit set these last two weeks. When day temperatures exceed 85°F and night temperatures exceed 72°F, tomato flowers will abort. July is definitely all about tomatoes, don’t miss enjoying them as much as you can. The Carrboro Farmers’ Markets annual Tomato Day is this Saturday and we have expanded it to the entire town with restaurants and other businesses participating with specials. Over 70 varieties to try and other samplings including tomato juice from us. Tomatoes are still in full swing with good supply. In reds we have an abundance of full flavored Big Beefs. The flood of Cherokee Purples is here along with its cousins the Cherokee Green and a few Cherokee Chocolates. A small supply of pink, low acid German Johnson. Plenty of the fruity bi-color Striped Germans. In orange/yellows there are Orange Blossoms and the beautiful Kellogg’s Breakfast. In cherry types we have a better supply of Sungolds and the mixed Sungold cousins Sun Lemon (orange), Sun Peach (pink) and Sun Chocula (I did not make these names up) and the bi-colored elongated Blush. The best supply we have ever had of the Italian Oxheart sauce tomatoes and beautiful Romas, if you want to make sauce, now’s the time. The peppers are starting with Shishitos and Padrons for appetizers and a few Serranos and Jalapenos. Sweet Red Onions and Basil to go with tomatoes! Flat Leaf Italian Parsley. Betsy and the flower department are still producing an amazing amount of beautiful stems. The Crested Celosia wave is beginning to roll. More long lasting Lisianthus, queen of cut flowers, mostly in purple with some pink and white. The second cutting of Delphinium has started. Lots of fragrant Oriental lilies in pink and white. The Zinnia flood rolls on with the Sunflowers. The airy and elegant Trachelium. Annabelle Hydrangeas for drying. Beautiful Bouquets! Wow! A look at the forecast brings a great shake of the head in disbelief that such hideous weather could possibly follow a day as succulent as yesterday and a morning as bright and clear as this one. Possibly five days of 100 plus degree temperatures with higher humidity, really?? This is certainly a stretch of temperatures to brace oneself for, plan the days carefully and for early exits from the field. 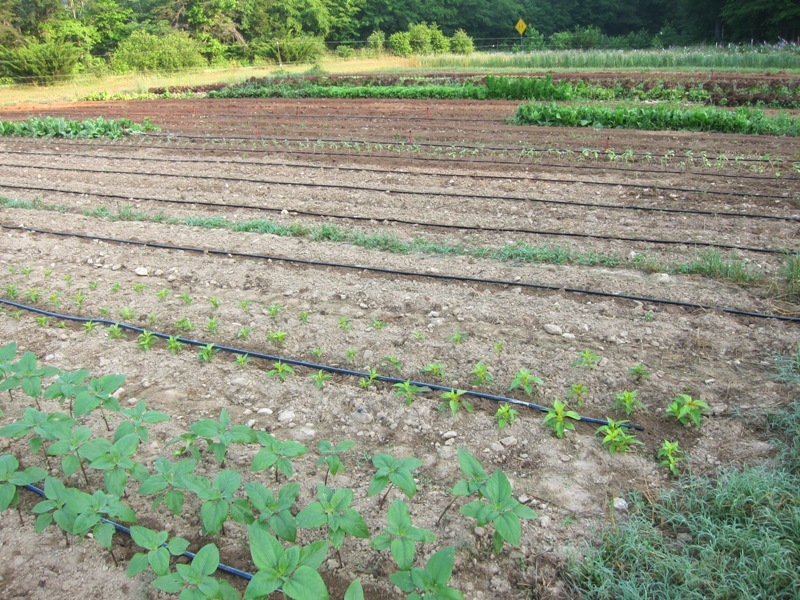 We must also irrigate early in the mornings to get the most from the tiny amounts of water that the drip irrigation lines deliver to the base of the plants while getting the field chores done. The turkeys are now two weeks old and growing fast. The extra eight or nine “runts” that came with the order are now clearly looking like a different bird. In years past, with other hatcheries, we have had roosters chicks added in to make sure that there were enough birds in the box to keep them from being jostled around too much during their trip with the USPS. I called our hatchery and asked if they had done such a thing and they said they never did that but if a mistake had happened they might be guinea hens or pheasants. After a quick Google search for two week old guinea hens and I am suspicious that is what we have. If so, it is not so bad in that Liz, who works for us, wants some guineas for her farm to eat the ticks. We’ll know better what they are in another week or two. An important note for the coming July 4th week. Because the 4th is on Wednesday the market will be held on Tuesday instead. That will allow you to get all of your holiday meal and picnic needs in advance and just in time. Until then, stay cool! The summer solstice, longest day of the year, last day of spring, summer starts at 7:09 p.m., the heat started yesterday, had to happen sooner or later. Tomorrow Betsy can start her annual chant “Now that the days are getting shorter, frost is just around the corner!”. It has been a marvelous late spring with nights in the 50’s and low humidity but it will all soon be a dim memory as we head into the tunnel of summer heat and humidity. Some good things come out of the right amount of summer heat. Tomatoes that taste better than just about anywhere else in the country for example. Without sun and warmth, the plants just don’t make enough sugars and other flavor components. 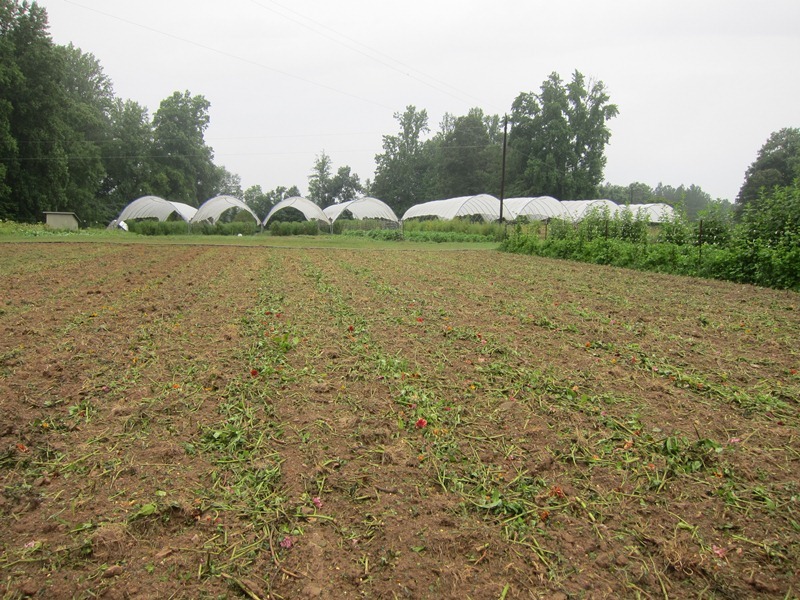 This is why greenhouse tomatoes or ones grown in the northern tier of the country, no matter what variety or how well tended, can never really have great flavor. There is a balance though. With too much heat and humidity, the plants stop setting fruit, there is more trouble with sun burned fruit (sunscald in the vernacular), hollow walls and blossom end rot when the plants just can’t move enough water up through the plant fast enough. This is why our farmer friends in the most southern tier states have tomatoes in June and maybe early July and then pack it in for the season until it cools back down. Fortunately we are entering tomato season at just the right time, plenty of fruit hanging on the vines waiting for the heat to finish the process. We pick more each harvest day and soon the table will be overflowing with all of the colors, shapes and sizes. Here’s to summer! So once again the August break is not long enough, not sure if it is because it is still really hot when we start back or if we had so much to do during the week that we need time to rest up? One thing that was discussed a great deal was the concept of a much longer break in the summer. I am increasingly convinced that these record breaking hot summers are not an aberration but a sign of what the new “normal” weather pattern is going to be. 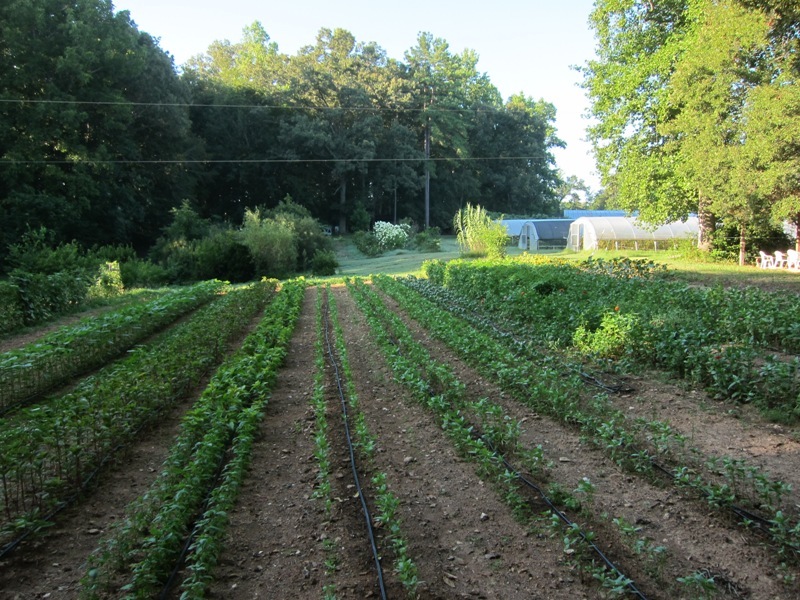 Our farming friends further south, in places like Alabama and Texas, have planned significant holes in their summer schedules to avoid the heat and folks in Florida don’t grow anything in the summer, just the winter. One of the main reasons for these planting schedules is because the crops just don’t do well in the intense heat, even tomatoes and peppers produce poorly when it is incessantly hot. The other reasons revolve around the quality of life for the farmers and farm workers, sure you can make yourself go out and get something done but is the pain worth it? 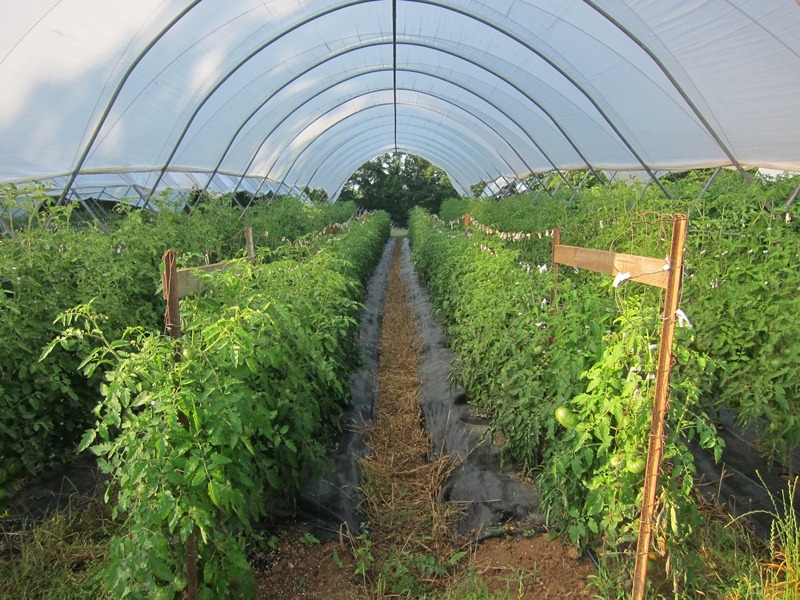 So we are toying with a modified schedule that moves the main tomato planting up a bit and the peppers back a bit to allow for a longer period in the summer with not a lot going on. We can not stop growing tomatoes and peppers, it is too much what we are but maybe we can move them into better conditions for them and us. Now a longer break doesn’t mean we shut the place down, there is just too much that has to be kept rolling for that. There are fall crops to seed and care for, summer crops that need to be irrigated and maintained, turkeys to move and manage. It would look more like a rolling break. Betsy and I might go away for a week or two, while the staff keeps it all under control and then they could each take a week off and get away to someplace cool while we do the maintenance. It would also mean we would probably go to market further into October than in the recent past. Hmmm…lots to think about? We did have fun last week, we got to the mountains to some slightly cooler weather and finally got to visit one of our former staff Rett. Rett worked for us from 2004-2006 before he moved to a farm in the mountains. He now has a new farm that we had not yet seen, so we had to go inspect, a beautiful place on the banks of the Cane river with soil to be envious of. We also had a couple of great dinners out with friends and some quality time in the air conditioning. Back to regular duty now. I always say “If you are going to suffer, you might as well set a record”. Five consecutive days over 100 degrees, the previous was four in 1983 and 2008. What a summer and this week looks just as brutal. One must transcend this and keep pumping water. 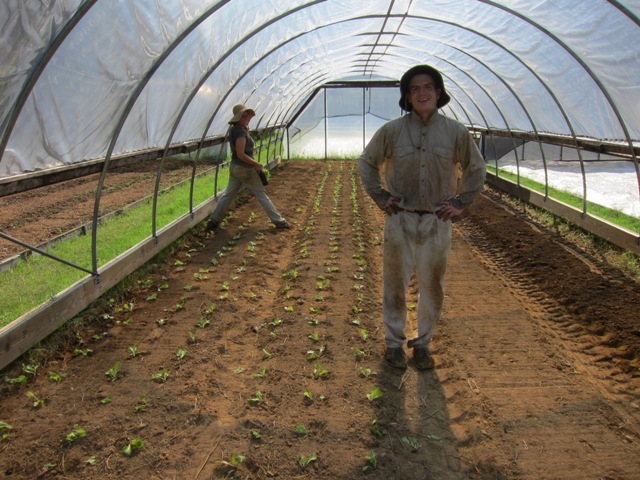 To make it seem like fall, we are planting lettuce, turnips and radishes today! Brussels Sprouts for Thanksgiving are already in the ground and the Celery goes in today as well. If you think it is fall, then it will come, we just have to get through August. 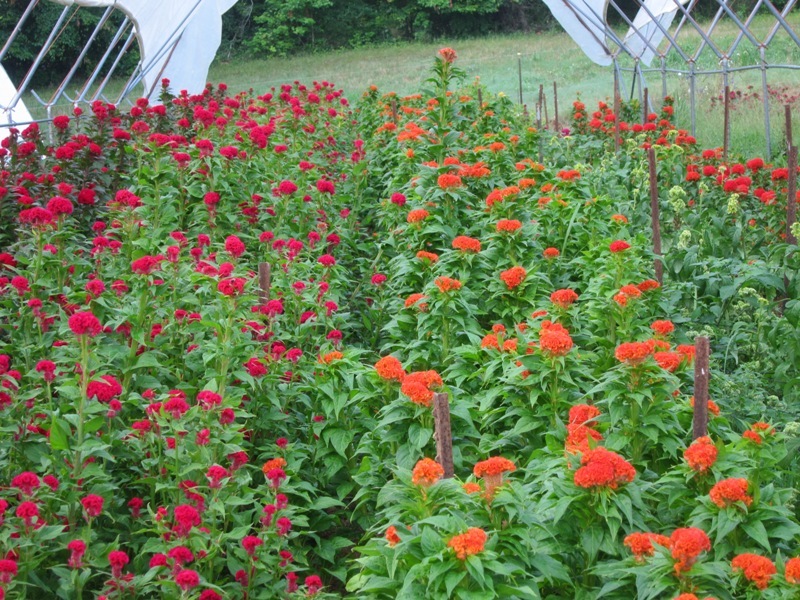 We are slowly turning the seasonal page as we mow down the first Zinnias and take out trellis for the early Celosia. Soon we will be taking out the early tomatoes, deconstructing the trellis and preparing for disking residues into the ground. In preparation for fall we are taking our traditional August break next week. Looks like perfect timing again as the early tomatoes are on their precipitous decline just like our energy is. It has been 22 weeks non-stop with only Saturday after market as our part day off so it is time to breath deep for a week and recharge a bit before heading into the last of summer and fall. Glenn and Jennie get a week off with pay so they can chill out too. We may go to the mountains for a day or two but mostly we will hide out here in the AC and slip out to turn on irrigation and take care of the turkeys. So no newsletter next week and we will not be at market on the 3rd and the 6th. Look for us to return on Wednesday the 10th. A quick newsletter today, too damn hot to not get out there early. We had a great Tomato Day at market last Saturday, great crowd, perfect weather and lots of tomatoes to taste and sell. If you were there you know how pleasant an experience it was. We also had a very pleasant Farm Dinner at Panzanella on Monday with a good turn out to taste the seven special dishes that Jim and crew made out of our produce. It was all good but I really liked the bright fresh taste of the tagliatelle with sungold and Roma tomatoes. It was good to see everyone who came. 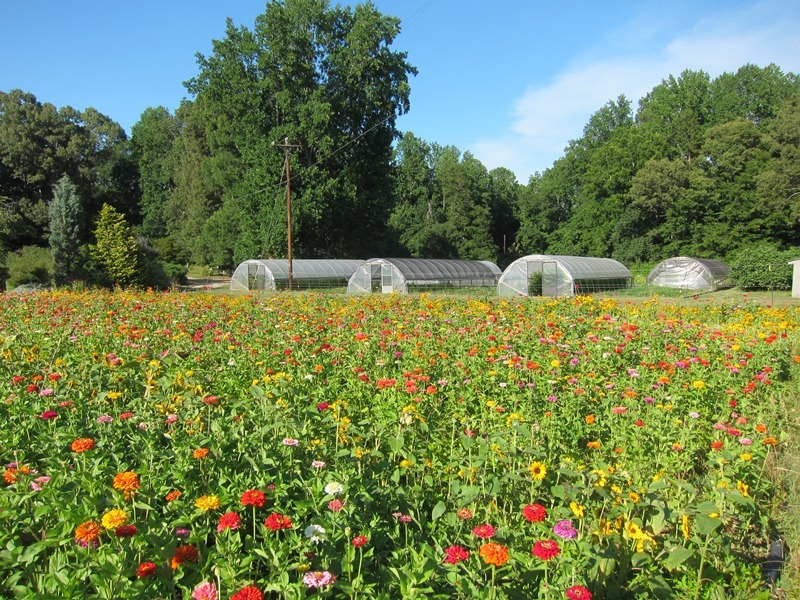 One more summer farm dinner this Thursday (tomorrow) at Fosters Market in Chapel Hill. Tim is using both tomatoes and peppers this year. It was a fun event last summer and Betsy and I will be there and I am sure I will talk a bit about the tomatoes in the dishes. Well the turkeys graduated from High School with flying colors last Friday. 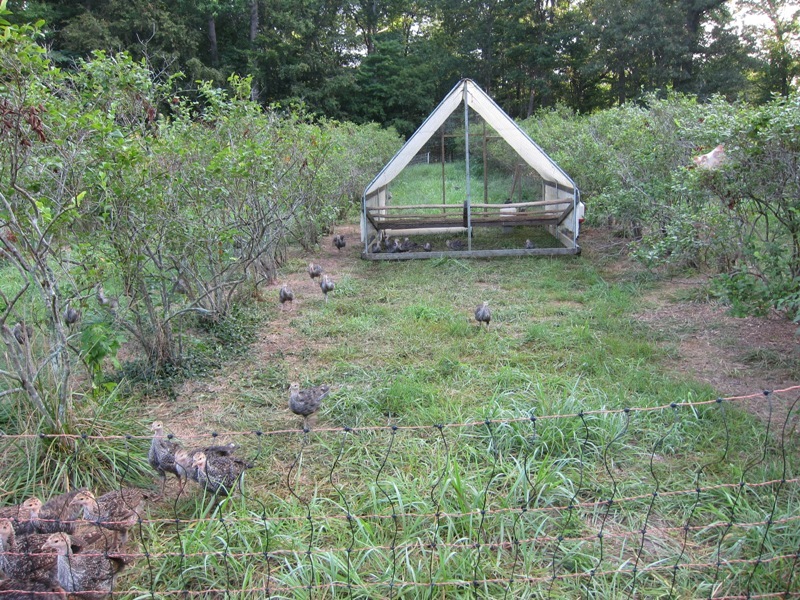 It was time to move them to the field and this group is so brilliant that we actually walked/herded them the 400 feet from the brooder to the blueberry field where they will hang out under the bushes for the next several weeks. We usually catch them, load them in the truck and drive them down and then set them out into the field, but this group has behaved so well that I thought it would be less stress on them to walk them down, it was. The final test was the first night, had they adopted the new mothership? They had spent a few nights in the portable shelter but in front of the brooder they knew as home. It is always a first time learning experience for the birds but once they get the hang of it, they act like they have done it for years. At dark I went out to herd them into the shelter and close the door for nighttime security. I rounded the corner and they were all pre-loaded and ready to sleep, and they have done it every night since, amazing! So this group is well on the way to graduate degrees! The heat? So I see that we are one day ahead of last years record setting pace for days over 90 degrees, at 40, the record is 91 and I hope we don’t get there. These are the days we work hard to get out of the field and the sun by noon at the latest. Down into the deep shade to work at the packing shed, or seeding fall crops or something similar. It is just not practical to be out in the field moving like turtles, suffering to do something poorly or taking two or three times as long to get the job finished over what it would take to do in the cooler hours of the day. Some folks say I’m getting soft in my old age, I just think I am getting wiser. Good class last night at A Southern Season cooking school. It has become an annual event where Craig LeHoullier and I carry on about tomatoes and Marilyn Markel (who is the manager of the cooking school) is calmly cooking up some great dishes with our tomatoes. If you haven’t ever taken a class there it is very well done, entertaining and you get a whole meal (with wine included) for a very reasonable price. I have mentioned this before but Craig is the god father of heirloom tomatoes. Back in the early 90’s when nobody knew what an heirloom tomato was, I came across an old fashioned printed newsletter that he co-edited call Off the Vine. It was an amazing resource on all of these crazy varieties where he and others would share their successes and failures growing these unusual tomatoes. Craig now keeps almost 3000 varieties in his personal seed bank and shares his new finds with the world. Maybe most importantly he is responsible for introducing Cherokee Purple to the seed companies and for discovering the new Green Cherokee. He lives in Cary and over the years we have communicated and run into each other. 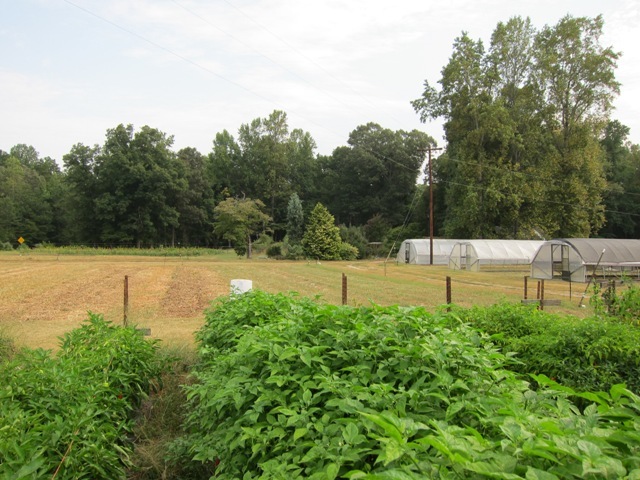 Finally a few years ago we began doing these cooking/gardening classes at A Southern Season and it has been great fun to learn more from him about where these varieties come from, the stories behind them and the new work he is doing on easy to grow varieties for the home gardener. Another amazing resource we have here in North Carolina. Heat anyone? High 90’s today, it will be another great afternoon at the Farmers’ Market. At least it looks like the weather will break a little for Farm to Fork on Sunday afternoon, they are calling for 90 with a slight chance of thunderstorms, if we are really lucky it will be like last year when the storms went around us but also helped keep the temperature down a bit. Next year F2F will be back in late May and more reasonable weather chances. By the way, F2F is sold out and did so very early after tickets went on sale so make sure that you look for the announcements next year if you didn’t get a chance this time around. One group that is happy with the heat are the new turkeys. Yes turkeys are back in the house, literally the brooder house. They arrived last Thursday and look really great. The little day old poults arrive unfeathered, with just their down coats and so they need to be kept around 90 degrees for the first week or two so they don’t get chilled and until they start to grow real feathers. We have heat lamps in the brooder at night but these days we turn them off during the day and they are very happy in there at 95 degrees from the sun. We have changed up the turkey program a bit this year in that we are only doing the Broad Breasted Bronzes and no Bourbon Reds. I have wrestled with this decision for some time and feel somewhat a traitor for not continuing to help preserve the heritage breeds but there are compelling reasons, quality of life and economics. The Bourbon Reds, while more charismatic and beautiful to look at, are a pain at times to manage because they fly and fight with each other, I am getting too old to be chasing birds around the woods like last year. The other is that they are much more expensive to raise and with feed prices extremely high this year we would have to charge too high a price in my opinion. On the other hand the Broad Breasted Bronzes are the first step from a heritage bird towards the modern industrial turkey. Yes they can’t naturally breed because of their size but they do very well outside on pasture. They forage pretty well, don’t seem to be anymore disease prone than the Bourbons and take only half the time to reach maturity without flying or fighting. Another factor is that you told us after last Thanksgiving that maybe you even liked their flavor better. So with that in mind we have 70 all singing, all dancing Bronzes in the brooder, now the adventure begins. It is getting crispy and brown again out in the fields, at least where it is not irrigated. A few notable weather statistics from this summer. Because we all had our eyes focused on Earl last week it slipped by most people that both Raleigh and Greensboro set the records for the hottest meteorological summers (June, July, August) ever. RDU by two degrees! Most of these records are broken by a tenth of a degree or two, not whole units! The other record is still in play. Today will be the 80th day over 90, the record is 83 from 2007. We are already seven days ahead of the pace set in 2007, I am sure that one is going down too. I always like to think if we are going to suffer at least we should have a record to show for it. Betsy and I will be there for sure, I will go just about anywhere for a good relleno! The other thing to not forget about is reserving your turkey for the Holidays, as it will slip by faster than one thinks and the orders are rolling in. No more Wednesday markets for us, just not enough produce to fill out two markets well. We are moving into the full dismantling phase of fall farm chores as well. Only four rows of tomatoes left, the first of the Big Top covers come off today, the little tunnels are getting cleaned up and the all the wood oiled for the winter. By the end of next week the only things left in the field will be the peppers and a few rows of flowers. If it would just rain a bit we could begin to get soil ready for cover crops.